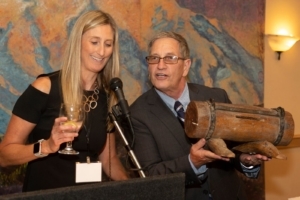 Stefanie Maio and Richard Miller challenge the audience to identify a Chapter relic. Skip Forsht, long time Sierra Club member and past Ex Com member and past WBC chair was inspirational in his role as emcee. 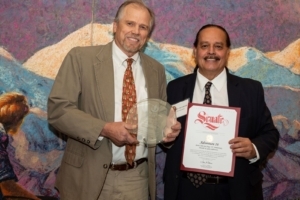 Ruben Arizmendi, Sierra Club San Diego Chapter Chair and Richard Miller, Chapter Executive Director, oversaw the presentation of the awards. 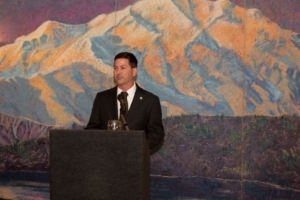 City Councilman Chris Ward started the evening introducing Senate President Pro Tempore Toni Atkins who received a FEAT (Fantastic Environmental Action Taken) Award for her long years as an environmental champion first as an aide to Chris Kehoe and then as a City Council District 3 representative, then as Assemblywoman and Speaker of the Assembly and now as a State Senator. Senator Atkins known for her commitment to the natural environment and social justice issues talked of her youth as the daughter of a southwestern Virginia miner father and seamstress mother. She decried the false hope being presented to miners who have been left behind—noting coal won’t and shouldn’t be brought back—that economics is steadily moving the world away from fossil fuels toward carbon-free energy solutions. 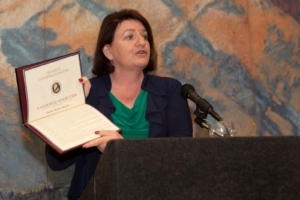 California Senator Toni Atkins presenting CA Senate Memorial Resolution to the family of Joanne H Pearson. Senator Atkins was most eloquent in her reminisces about Joanne H. Pearson whose Memorial Award was being presented for the first time. She praised Joanne who she first met as a City Councilwoman. Joanne would show up regularly at numerous City Council meetings and California Coastal Commission hearings successfully pleading the case for maintaining public access along the entire La Jolla coastline. Senator Atkins graciously provided Senate proclamations for all of Joanne’s children. 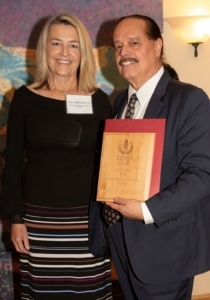 The other FEAT awardees were A-16 and Sunbelt Publications both long-time supporters of San Diego environmental community. A-16 was acknowledged for their nearly sixty years of cutting-edge advancements in developing backpacking and outdoor travel gear, for supporting the outdoor community and the San Diego Sierra Club Chapter and Wilderness Basics Course for many decades. 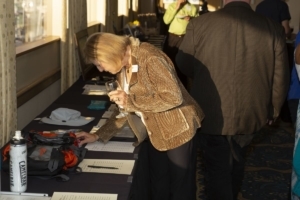 A-16 provides philanthropic support not only for the Sierra Club and other environmental organizations but also for Community through workshops, events, instructors, expertise, student, discounts and the Donate-A-Pack Foundation for underprivileged children. Together A-16 and the Sierra Club share a commitment to preserving the beauty and accessibility of our mountains, trails and natural environment while instilling a love of – and respect for – the outdoors. 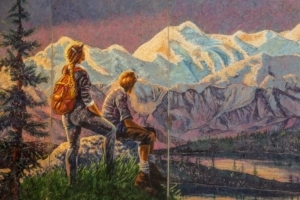 Sunbelt Publications was honored for their thirty years of publishing natural science and outdoor guidebooks, regional histories and reference books and stories that celebrate the land and its peoples. Sunbelt has been instrumental in documenting the natural, historical and cultural heritage of California, the Southwest and Baja California. Diana Lindsay, Sunbelt President, stated she and her company wanted to get information about the southern California environment to people so they could know what’s out there, explore, appreciate, and know it’s worth protecting—that’s the mission. Sunbelt Publications has actively supported the Chapter and the Wilderness Basics Course among its other environmental activities. Several of Chapter members have authored or edited Sunbelt publications. 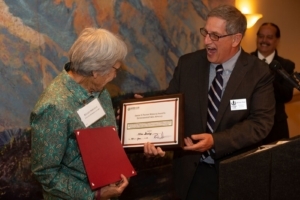 This year marked the first Joanne H. Pearson Memorial Award in Environmental Public Advocacy. 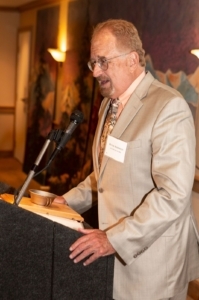 The Award will be presented annually to a Sierra Club San Diego volunteer who is committed to protecting public rights as they relate to land use or environmental protections in the greater San Diego region. 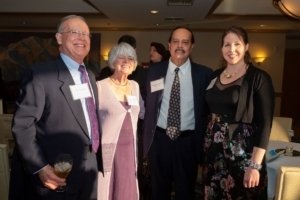 The family of Joanne Pearson established the award and its $1000 grant in memory of their mother who was a highly recognized San Diego land use and environmental activist. From 1997 to 2005, Joanne chaired the San Diego Sierra Club’s Coastal Committee playing a lead role in addressing coastal projects before the San Diego City Council and California Coastal Commission. 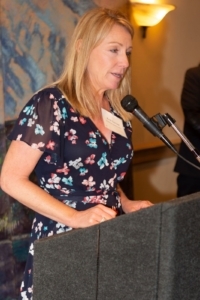 In 2004, she organized an environmental coalition to testify successfully before the California Coastal Commission for adoption of the La Jolla Local Coastal Program Update, which resulted in acceptance by the City of San Diego and the California Coastal Conservancy of all outstanding public accesses along the La Jolla coastline. 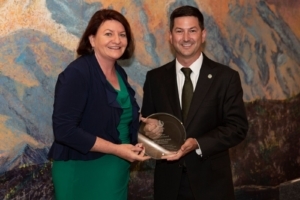 In 1994, Joanne received recognition from the California State Assembly “in honor of her commitment to preserve and enhance our coastal environment, and for her in-depth research and effective testimony before the California Coastal Commission.” In 1997, she was named the California State Assembly “Woman of the Year” for the 78th Assembly District. Joanne’s family, represented by her daughter Sarah Gauger, wanted to publicly acknowledge the commitment and often unrecognized costs of volunteer service for those who represent the public interest. This award is a sincere and heart-felt thank you to those who sacrifice time away from family, pay their own costs for copies, computers, phones, travel and the like, who are often pitched against well-financed and well-heeled interests and forces, and who despite it all, advocate for positive change in the interest of the greater public. Sarah spoke lovingly of her mother and presented the Award and $1000 check to the first recipient, Ellen Shively. 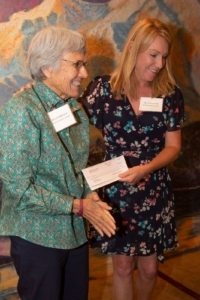 Ellen Shively accepting the Joanne H. Pearson Memorial Award in Environmental Public Advocacy and a check for $1,000 from Kate Gauger, daughter of Joanne H. Pearson. Ellen has been an activist with the Chapter for 30 years. Her journey started with a Chapter hike, which led to attending hearings and rallies for no-offshore oil drilling, stopping orca captures for commercial interests and walking to protest SDG&E power lines cutting through Anza Borrego Desert State Park. She began serving on the Chapter Conservation Committee, which she still does. She served on the Chapter Executive Committee and as Chapter Chair then became Chair of the Conservation Committee. For the past 10 plus years her mission has been to help save and protect the harbor seals of La Jolla. That journey continues today; she works to educate the public, speaks with school children, attends street fairs and public events, meets with elected officials, Coastal Commissioners and anyone willing to listen. Most of her days and weekends are spent at the La Jolla Cove where she is only too happy to explain the difference between seals and sea lions. She has helped recruit volunteers, train docents and provide leadership. In acceptance of the Joanne Pearson award, Ellen thanked several of her mentors and spoke highly of Joanne Pearson as one of her cherished mentors. Ellen stated her $1000 Award would go immediately back to the Seal Society of the Sierra Club San Diego . Recognition was also extended to several other Chapter leaders and volunteers who have contributed their time and effort to the success of the Chapter and who have worked hard to safeguard the environment and address issues of environmental justice. Rochelle Hancock, Chapter Treasurer, was awarded the rarely given Chapter Service award for her exemplary efforts to manage the Chapter finances in very special circumstances. In 2016, she volunteered to assist Chapter Treasurer, Rob Morris, with bookkeeping and treasurer duties. Then with his sudden and untimely passing in July 2017, she agreed to step up and assume the full responsibilities of Chapter Treasurer. This meant learning all the enormous complexities of Sierra Club finances, completing the End-of-the-Year fiscal reports from all 13 sections, groups and the Chapter finances much of which she had not even seen before. She spent hundreds of hours successfully completing this herculean task. Volunteer of the Year Award was presented to Stefanie Maio recognizing her consistent, dedicated, multiple and outstanding efforts to further the Club’s overall mission. Since her introduction to the Wilderness Basics Course in 2006, Stefanie Maio has been has been a one-woman army covering a variety of roles with WBC including Advertising, Public Relations, Social Media, Email Marketing, Outings Coordinator, Website Designer and Chairperson of the 2016 and 2017 Wilderness Basics Course overseeing a staff of 70 volunteers in teaching backpacking fundamentals to the community. Stefanie has also been the Communications Coordinator promoting the trips for the Bus Trip Section. In addition to being a Chapter Outings Leader Level II, she is currently the Leader Training Coordinator and is instrumental in developing new Chapter Outings Leaders to explore, enjoy and protect the planet! In 2017, Stefanie along with other key Chapter leaders participated in the National Sierra Club Growing for Change Workshop dedicated to changing the culture of the Sierra Club to focus not just on environmental protection but to do it with justice and equity and inclusion for all. Rochelle Hancock accepting Chapter Service Award from Chapter Chair Ruben Arizmendi. Stefanie Maio accepting Volunteer of the Year Award and CA Senate Certificate of Recognition from Chapter Chair Ruben Arizmendi. Michelle De Nicola accepting Rookie Activist Award from Chapter Chair Ruben Arizmendi. Michelle Di Nicola was recognized with the Rookie Activist Award for her volunteer activism as a new member around zero waste management. After attending a few Conservation Committee meetings during the past year, Michelle took a leap and became the Zero Waste Chair of the Conservation Committee, and soon after, became a member of the Sierra Club California Zero Waste Committee. Michelle spoke on behalf of the Sierra Club at the 5th Annual Zero Waste Symposium in San Diego and attended the First Annual Environmental Leadership summit. She is also involved in Environmental Justice and has been a leader in helping with the Chapter’s member Orientations. Many times, you can find Michelle at the Chapters booths and tabling events. It is the enthusiasm and hard work of new activists such as Michelle that makes the Chapter a leader in the environmental community. Two outstanding volunteers were recognized with the Outings Leader Award-Kit Davis and Rachel Rench. The Outings Leader Award recognizes a Chapter Outings Leader who has done exemplary work in outdoor leadership and education. The Outings Committee takes the lead in providing safe, enjoyable, and informative outings opportunities. The first experience with the Chapter of many members and volunteers is on a Chapter outing. Kit first took the Wilderness Basics Course in 2002; she became a volunteer for the North County WBC in 2004 and a Chapter Outings Leader in 2006. 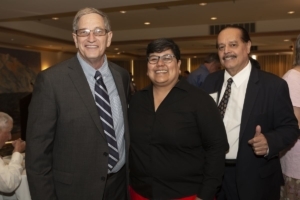 In the last few years she was the North County WBC Treasurer, organizing and updating accounting records and practices; she was then elected to the North County ExCom. Two years ago, she took on the role of North County WBC Outings Chair. In her role as Chair, Kit has been open to new ideas, taken steps to reorganize the way WBC Outings are handled, made the process more inclusive by creating and training teams of volunteers to help with the activities simplifying and improving the student experience. Kit’s enthusiasm and love of hiking and backpacking is evident in her lectures and her interactions with the students on the trail. She is not only an avid backpacker; Kit is an Alpinist and mountaineer as well. In her free time, she can usually be found in the Sierras, her favorite place for climbing, hiking, and backpacking. 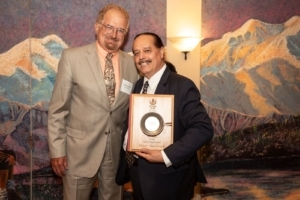 Kit Davis accepting the Outings Leader Award from Chapter Chair Ruben Arizmendi. Rachel Rench accepting the Outings Leader Award from Chapter Chair Ruben Arizmendi. 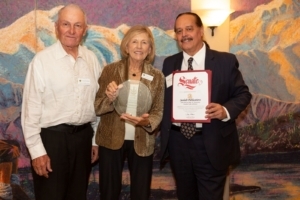 A Distinguished Achievement Award was presented to long time Sierra Club member, Sally Prendergast, Chair of the North County Coasters Group. Beginning in 2015, Sally joined in the effort to reconstitute and organize the North County Coaster Group. 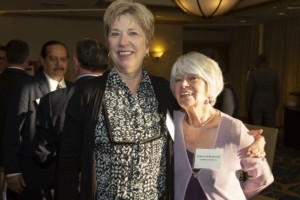 She was one of the first to step forward and assume leadership in re-establishing the North County Coasters as an active vibrant group addressing the multitude of issues confronting the San Diego North County coastal communities. In 2016, she was elected by the membership to the North County Coastal Ex Com and was named Chair by the Committee. Under her leadership the Group has engaged the community with a series of meetings featuring speakers and City leaders on topics ranging from sea level rise to development issues, has been active in Conservation efforts and political endorsements. Sally has been integral to development of relationships with other North County environmental groups to leverage efforts on shared goals. Over the years Sally has been involved with a number of local issues related to development, traffic and conservation and is grateful to have the opportunity to direct her strategic marketing and management skills to work on behalf of the environment for the Sierra Club. 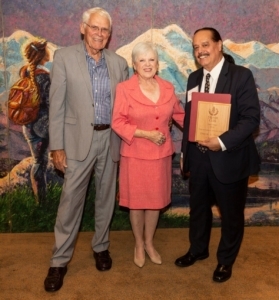 Derek and Nancy Casady accepting the Conservation Activist Award from Chapter Chair Ruben Arizmendi. 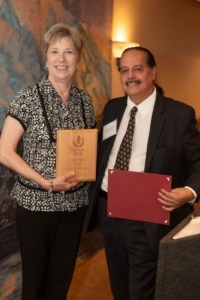 Sally Pendergast accepting the Distinguished Achievement Award from Chapter Chair Ruben Arizmendi. Derek and Nancy Cassady, long-time Sierra Club members, received the prestigious Conservation Activist Award in recognition of their extraordinary efforts in raising awareness about our country’s most crucial conservation need to address the looming crisis of climate change. Three and half years ago they became involved with the National Climate Mobilization Organization and have been laser-focused on raising community concern about the need for immediate action to prevent climate and ecological disaster. Nancy shared the Scripps Institute of Oceanography assessment that there is a ten percent chance of human extinction by 2050 if we continue on the current path. The crisis is here now and will require America to move to a new national energy system based on wind, water and solar energy at the scale and speed of our efforts in WWII. Derek and Nancy’s San Diego Climate Mobilization Coalition continues to regularly hold public rallies posting their demands on federal buildings demanding the Federal Government take necessary action to address the causes of climate change. One of their more creative actions was to hold a midnight rally in Balboa Park and have former Congressman Jim Bates ride in on a horse like Paul Revere to warn the assembled patriots about the coming climate disaster. Their long-standing, focused and unceasing conservation efforts to protect our planet are truly deserving of this important Sierra Club recognition. The Club’s highest award, the Silver Cup, which is presented to the person who has most significantly contributed to the success of the Club’s mission over a lifetime, was presented to Peter Anderson, Sierra Club San Diego Steering Committee Vice Chair. Peter’s activism with the Chapter goes back to 1991. An environmental impact report is supposed to be an “alarm bell” that alerts both the public and its responsible officials to serious consequences before a project has reached the ecological point of no return. Unfortunately, the alarm wasn’t working in 1991 when the San Diego City Council authorized a four-lane extension of Jackson Drive through Mission Trails Regional Park. But that bell set Peter Andersen into action. 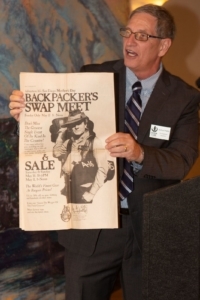 Peter organized Sierra Club activists, formed a committee and eventually became the lead plaintiff in a law suit to stop the extension and was successful. Over the years Peter has demonstrated activism not only here but also across the United States. He helped to stop the Jamul Quarry in our backcountry, prevented the flooding of Canaan Valley in West Virginia and led the fight to preserve the Volo Bog in Illinois. Vice Chair Peter Andersen with Silver Cup Award. Peter Andersen accepting the Silver Cup Award from Chapter Chair Ruben Arizmendi. 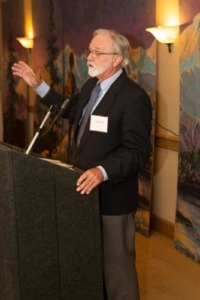 Peter has been a member and activist of the Sierra Club for over 40 years. In the late 1990’s and early 2000’s, he served two terms on the Chapter’s Executive Committee. After the Jackson Drive fight, Peter became active with the Chapter’s Political Committee. His belief is bad political office holders’ equal bad environmental choices. Peter served three terms as Chair of the Political Committee. In 2017 he was recruited once again to serve in a leadership position on the Chapter Steering Committee where he continues to serve today. 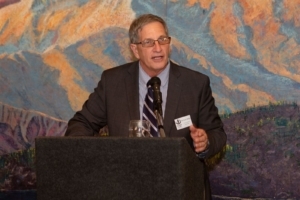 Peter has also become active state-wide, elected to the Executive Committee for Sierra Club California and he serves as a member of Sierra Club California’s Political Committee. For all these reasons and more, the San Diego Chapter was proud to present its Silver Cup Award to Peter Andersen. Events like the Annual Awards and Gala do not just happen by themselves. Event sponsors included Sullivan Solar Power, the Port of San Diego, Republic Services, Senator Toni Atkins, and Thomas Creative Services. 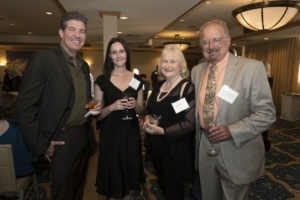 Auction item donors included a host of San Diego businesses and organizations and provided an array of auction items for which the Club is most grateful. This special event was created, planned, organized and presented by the Gala Planning Committee of Richard Miller, Stefanie Maio, Suzi Sandore and Karenlee Robinson. John Hancock provided the photography and Martha Marquez, Administrative Assistant, provided much needed administrative assistance. But it was Richard Miller’s leadership and colossal efforts—ably assisted by husband, Curtis Robertson, that made the event happen. Now on to the next 30 years working to the century mark for the Sierra Club San Diego! Karenlee Robinson and her husband, Jay Shaffer, first took WBC in 2010 and then again in 2011 and 2012. At one point Karenlee raised her hand and offered a few suggestions to improve the course and became the Program Coordinator for three years. She and Jay also became COLs I and II and have led WBC Outings. 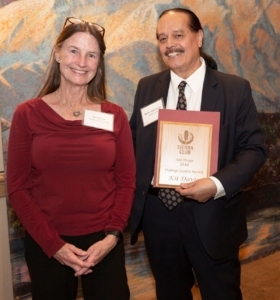 In May 2014 to the present Karenlee has served as a member of the Sierra Club San Diego Steering Committee. She is dedicated to the mission and values of the Sierra Club.